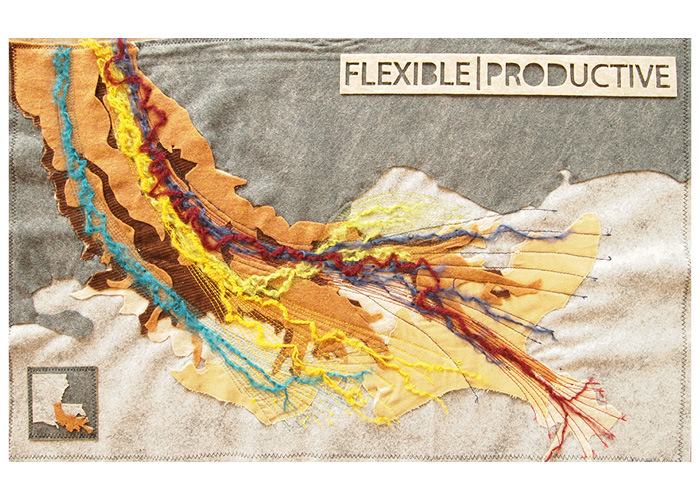 Projects from the ParadoXcity Miss!ssippi 2011 studio. A smart system for water management is flexible and can adapt to various conditions to most effectively distribute stormwater based on demand. 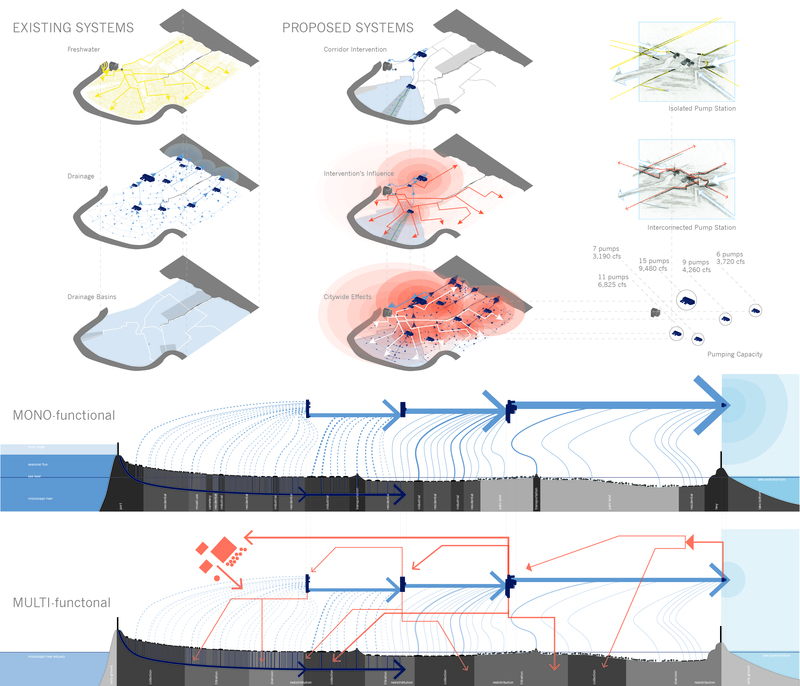 This system acts in contrast to the current mono-functional system that simply pumps water out of the city. 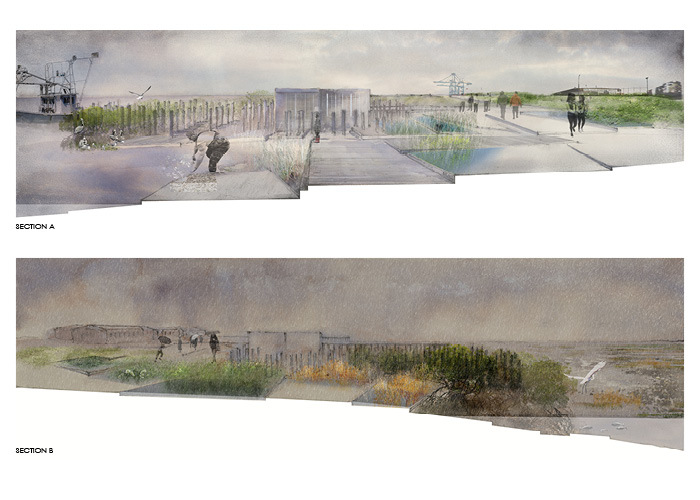 The addition of swamps to the system in the first phase facilitates the creation of new, dynamic public spaces in New Orleans. 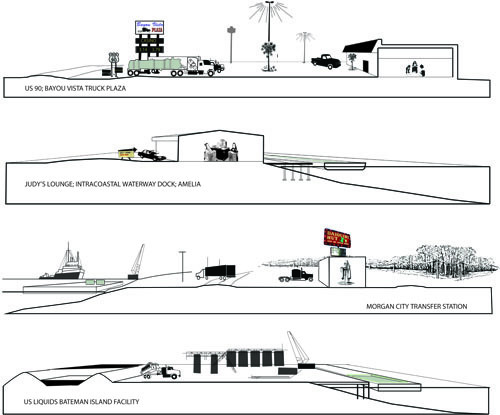 In this smart system, the pump stations act as central nodes. Each pump station has anywhere from one to fifteen pumps, which can be individually controlled to modulate and allocate water throughout the city. 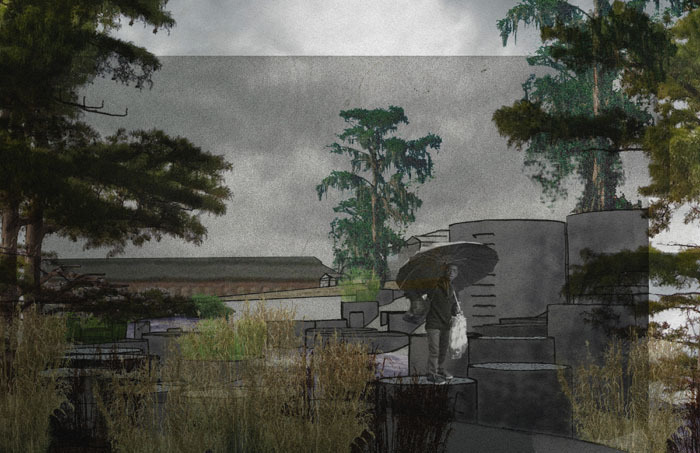 By tying the largest pump station to the water treatment facility, the ultimate goal is for the 64 inches of precipitation that falls on New Orleans every year to be cleansed and repurposed to serve all freshwater needs in the city. 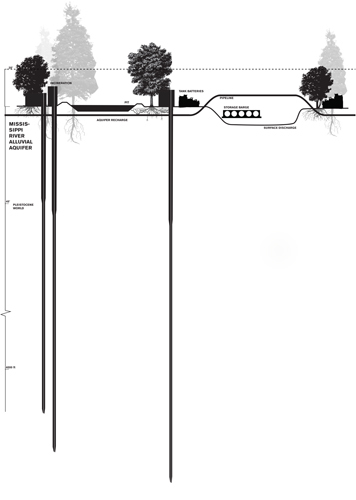 This project proposes the proactive approach of allowing a gradual shift of the Mississippi river to the Atchafalaya basin at 1% per year, over 40 years, a strategy set forth in the EPA’s 1987 report, “Long-Term Plan of Action for Saving Louisiana’s Wetlands.” This would reverse the ratio set at the Old River Control Structure of 30% flow to the Atchafalaya and 70% to the Mississippi to gradually reach a flow of 70% to the Atchafalaya and 30% to the Mississippi. 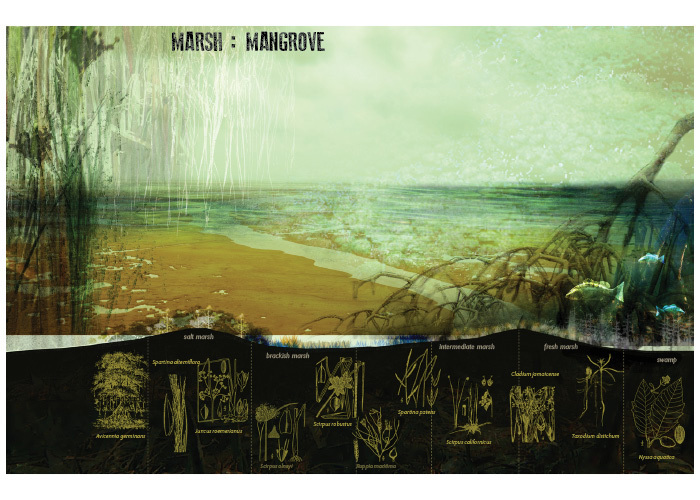 As the first line of defense, the strategy for the coastal edge includes the adaptation of coastal ecosystems to a more saline, warmer environment by the planting of mangroves. 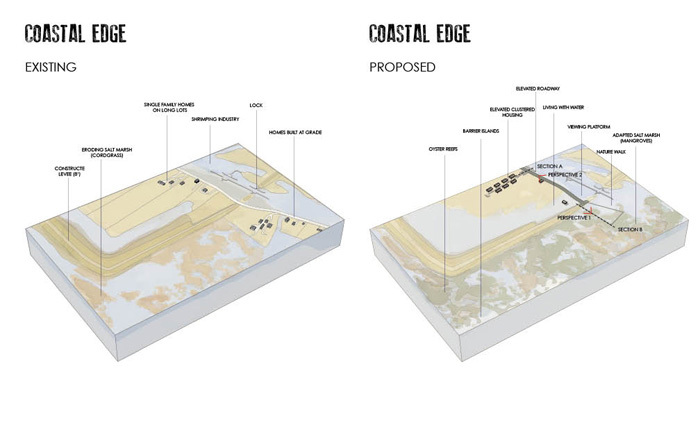 To provide New Orleans with long-term protection from storms and sea-level rise, the city edge is reimagined as the second line of defense. 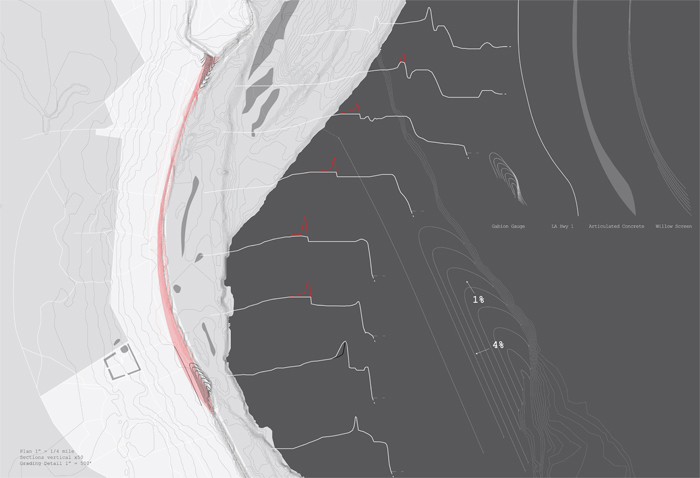 Small coastal communities will be able to continue historic inhabitation patterns by adapting housing typologies to a watery, dynamic environment. 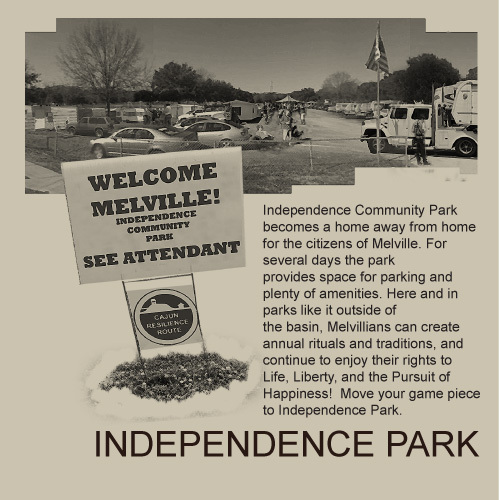 These fishing communities will be clustered behind the protection of barrier islands and natural levees and boating will be the primary mode of transportation in these areas. The mangroves will provide a new habitat to many species of fish and birds, which will aid in sustaining small commercial fishing operations in the area. 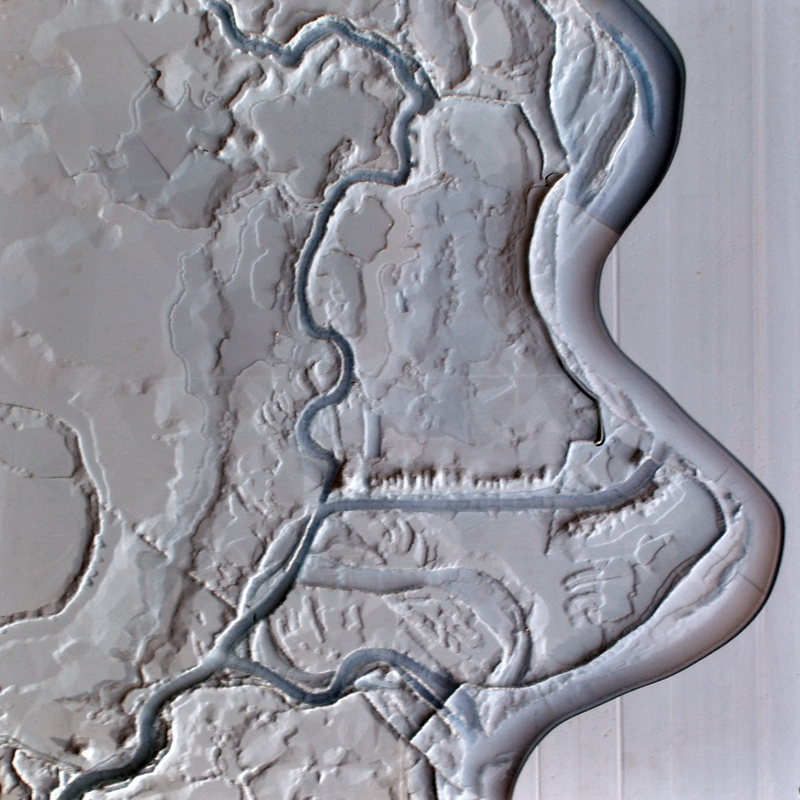 This research suggests that the conditions for Mississippi avulsion have been created through a delta management paradigm which promotes river degradation to maintain navigation and flood relief. 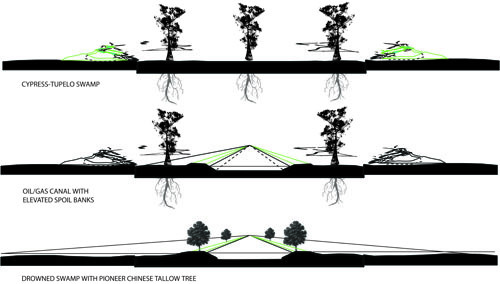 Levee Pruning opportunistically utilizes the alluvial landscape infrastructure above the Old River Control Complex as a new spillway, mitigating degradation of the Old River Outfall Channel and reducing strain on Control Structures. The ACOE levees are lowered and widened where the existing alluvial levee is highest so that the Mississippi gradually spills over as sheet flow into the Red River backwater area during flood stage, creating a resilient flood diversion that is gradually activated based on the needs of downstream settlement, reducing average flow through Old River to what is necessary for navigation and delta growth. 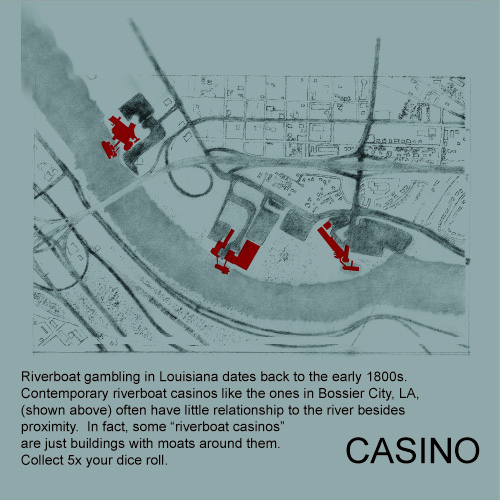 This project explores the current landscape of the Atchafalaya basin and proposes an adjusted future using the tool and the metaphor of the board game. Board games are rule-based and internally consistent, they are reductive like a diagram, they are dynamic (one board, multiple sets of rules), they are transparent, accessible, and understandable by people of different disciplines and levels of education, and they are emergent/generative in that the logic of a game reveals itself over time. 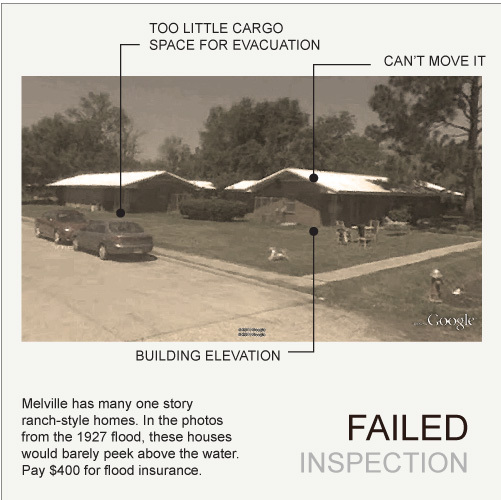 From small ring-levee towns like Melville, LA, where 41 people possess federal insurance, to vast swaths of marsh interwoven with an impossible tangle of existing oil pipelines, the landscape of the Atchalaya basin is characterized by a blend of the perverse and the absurd. Learning to live with risks from flooding and waste exposure will take a fundamental shift in the rules underlying the landscape. Oil drilling and production wastes (E&P wastes) were exempted from classification as hazardous waste under federal RCRA regulation in 1980, despite the presence of significant amounts of benzene, toluene, ethylbenzene, xylene, and naturally-occurring radioactive materials within these wastes. Thirty years later, several thousand active and abandoned E&P waste sites are known to exist in Louisiana’s Atchafalaya River basin – and the presence of many more unknown sites should be assumed. Divinations examines the limits of convenient political and technological clean-up solutions amidst the fragility of this landscape and the magnitude of its destruction by the petroleum industry. 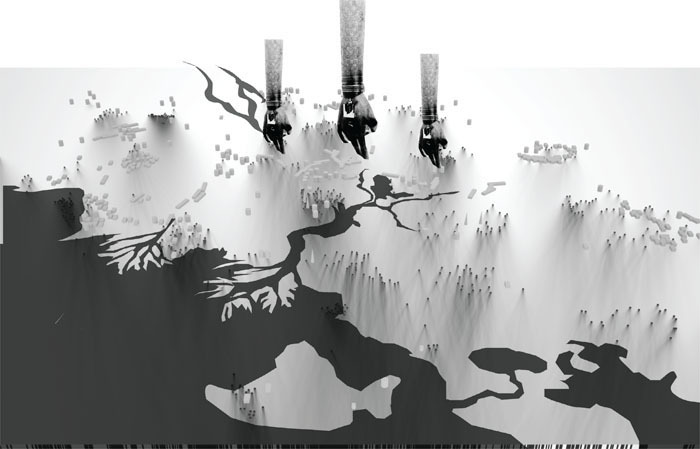 This project explores the implications of understanding Louisiana’s toxic wastes – composed of elements that exist on scales of time and space much larger than human experience – as objects imbued with sacred connotations, necessitating a system of alternative ritual practices: pilgrimages along US-90 and the Gulf Intracoastal Waterway; hierophants inhabiting daiquiri huts, truck stops, and night clubs; high priests in hazmat suit vestments; and inner sancta. 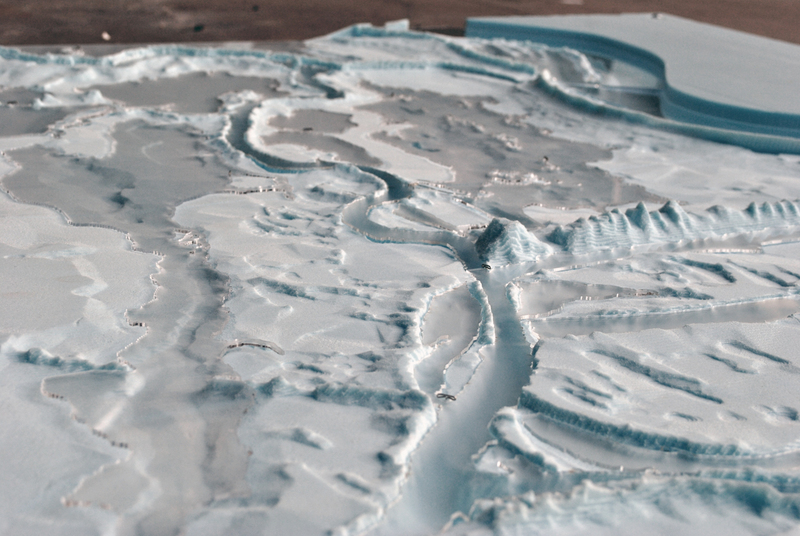 The anthropogenic ecosystems shaped by the industry – canal impoundments, spoil banks, tank battery farms, access ramps, invasive hyacinth, and so on – provide unique opportunities for unholy intervention.